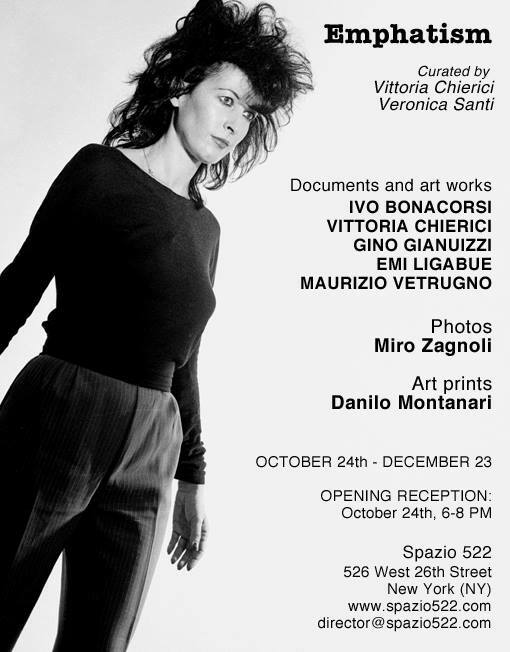 Spazio 522 is proud to present EMPHATISM, the fourth and last exhibition of the cycle “Italian Wave” celebrating 2013 – Year of Italian Culture in United States. The exhibition provides a documentation on the art movement Emphatism with art works from the beginning of the ‘80s by Ivo Bonacorsi, Vittoria Chierici, Gino Gianuizzi, Emi Ligabue, Maurizio Vetrugno and photographies by Miro Zagnoli. Vittoria Chierici about the exhibion: “Io sono come i miei artisti” [I am like my artists] – Francesca Alinovi, 1983. The name Enfatismo (Emphatism) popped up in the summer of 1983 on Flash Art magazine with an article by Francesca Alinovi, some interviews with the artists and quite a few images. The article had a sad editorial note announcing that Francesca Alinovi had passed away before publication. The article became a sort of macabre necrology. The Emphatists grew up in Bologna, in the mileu of the new experimental school, DAMS (Disciplinesof Art Music and Theater), founded in the late seventies by Umberto Eco, Renato Barilli and Nanni Balestrini, along with other avant-guard, post-war Italian intellectuals. The Emphatists, kept together by Francesca Alinovi’s charismatic personality, seemed like the ultimate representation of Marinetti’s Futurism or Situationism. They were, in fact, a phenomenon based more on urban culture, with bohemian and beatnik antecedents, very close to the spirit ofNew Wave in New York. I was studying art and art history in New York when I first met Francesca Alinovi at the Holly Solomon Gallery, on the night she presented “Italian Wave”, a group of young Italian artists. In 1981, the New York art scene was at the beginning of a new, brilliant and dramatic era, tinged by the onset of the AIDS epidemic. Francesca was fascinated by the urban street culture and it’s unexpected, improvised boundaries between art and life. She was less interested in the standardized glamour of the art market. She work with Keith Haring, Ramellzee, Kennny Scharf, Stefan Eins, the poet David Rattray and the incredible cast of the Graffiti art wave.